CCleaner is awesome, but it isnt portable. This version is. I found this over at the CCleaner forums. It saves settings to an ini file and all that. And I hate to burst your bubble but piriform? Isnt that Pirated Software? Criminal penalties for first-time offenders can be as high as five years in prison and $250,000 in fines even if the offender didn't do it for monetary or financial commercial gain!!!! it basically means shaped like a pear. and it looks like the forum moderators took care of it a long time ago. I am curious as to where they got their assumption that Piriform distribute illegal software? Edit: I see the user has been banned. CCleaner is currently v4.16.4763 (changelog at http://www.piriform.com/ccleaner/version-history). 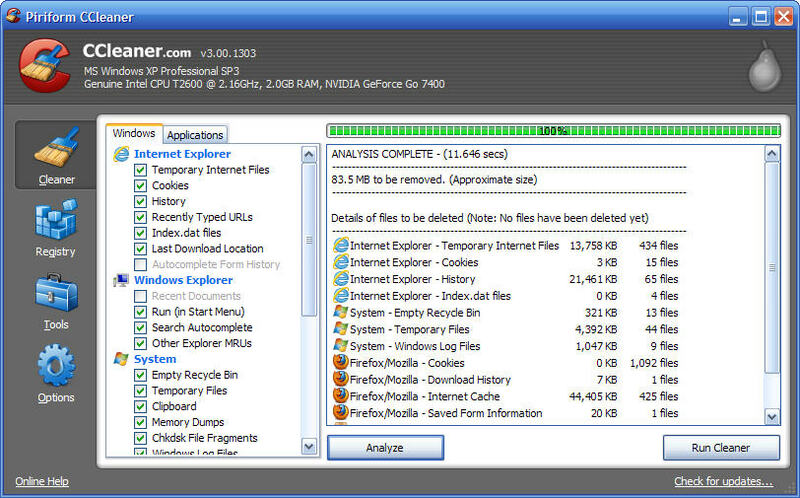 [url]http://www.piriform.com/ccleaner[/url] author wrote: CCleaner is the number-one tool for cleaning your Windows PC. It protects your privacy online and makes your computer faster and more secure. Easy to use and a small, fast download. Download CCleaner latest natively portable build from http://www.piriform.com/ccleaner/builds. Last edited by Midas on Mon Mar 23, 2015 2:02 am, edited 1 time in total. How did you find this app? Yeah, this pretty much screams "fake". Piriform probably couldn't care less since there won't be a lot of people that will be fooled by this. Seriously, it only has like 2 paragraphs and insists that it can boost system performance and increase free desk space. Last edited by lindataylor on Wed Mar 29, 2017 5:48 pm, edited 1 time in total. See the official documentation for information on generating a list of covered programs search for "Export". An unofficial set of community developed cleaning rules can be found here however it should be noted that many of these rules are alpha and the developers will not provide support for these rules, a thread in the users forum is dedicated to supporting the add-on rules. Could someone explain this? When I click on the "list of covered programs" link it goes to a command-line page. Searching "export" doesn't seem to have anything to do with the second sentence. I'd like to fix, better explain, or cut that. I decided to cut the first sentence. It indeed has barely anything to do with winapp2.ini. lindataylor wrote: How did you find this app? Yeah, this pretty much screams "fake". Piriform probably couldn't care less since there won't be a lot of people that will be fooled by this. Seriously, it only has like 2 paragraphs and insists that it can boost system performance and increase free desk space. Somehow I didn't see your comment when you posted it, sorry! It's freakin' listed on Softpedia and it even got the "100% clean" award! I don't know... it still doesn't feel right to me. Its just out dated info maybe. and not really an official feature yet. CCleaner is no longer a freeware. It is now free only for home usage. "- You may NOT use the Product in corporate or commercial environments." @popol0909: I have updated the license details. Thanks!